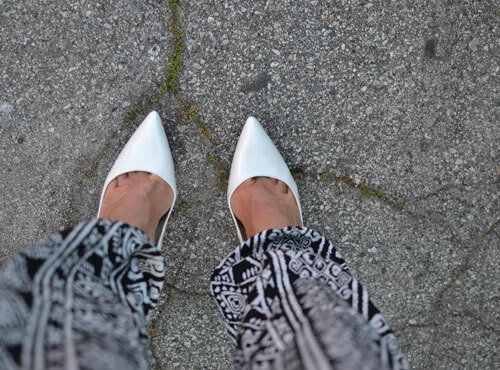 White pointy toe pumps have been on my wish list for a while now. I came across this pair by Nine West and it was love at first sight. They're almost identical to the $600 Manolo Blahnik "BB" pumps, only these are way more affordable. Oh, and they also happen to be really comfortable. In other words, get them. Now. After seeing these on your Instagram, I couldn't wait to find out where they were from - I've been looking for a pair of white heels and these are perfection!! Love those pants! Gorgeous look! WOw, those look great! I've also had issues with the toe cleavage on nine west shoes, but these look great! Ah, those pumps are fabulous! Great comfy yet chic look! Wow those shoes are really a dead-ringer to the Manolos!!! Fun pants! What a great print! Obssesed with this look!! Love it!!! !